On the weekend I had the opportunity to visit The Alpine Plant Centre, which is in the Hope Valley in the Peak District. Sadly the garden itself (above) wasn't open. I missed the NGS open days and must make sure I make it next year. However the nursery was, and I picked up quite a few alpines. I was so excited by the nursery that I forgot to photograph it. It is just what one wants in a specialist nursery. 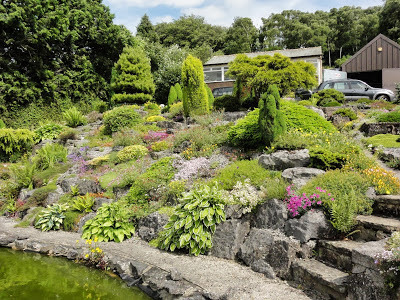 A large variety of plants, way beyond what you will ever find in a normal garden centre, well labelled and of high quality. 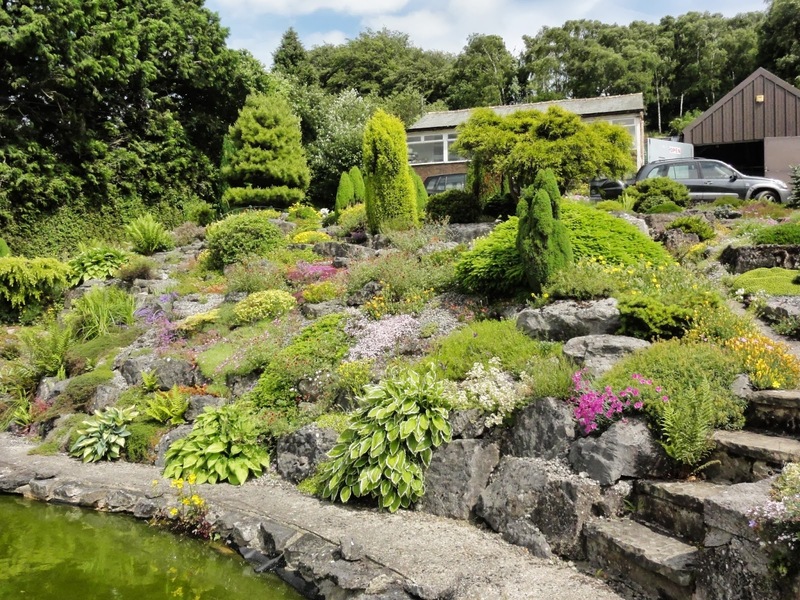 They sell a large variety of alpines, including rockery plants, tufa plants, saxifrages, sempervivums, sedums, primulas, gentians and even troughs are available. I was also very impressed by the prices, most going for £1.50 - £2, much cheaper than alpines in normal garden centres which are more likely to be around £3-4. Of course, the lower prices mean you feel encouraged to put more in your basket! They even made it easy shopping, by lining the baskets with trays to make sure your precious cargo didn't fall over. 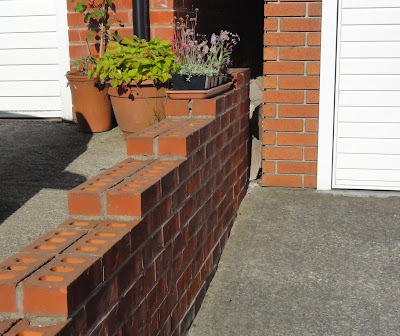 As you can see, the brick has lots of hole in them, and this led me to wonder if I could try and turn this not-most-attractive feature into a flowering wall? 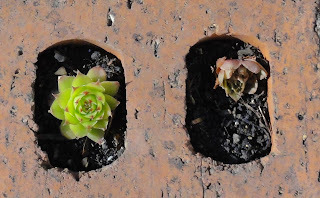 I tried experimenting a few weeks ago with some sempervivum cuttings and one of the two is definitely doing well. Many alpines grow in high remote places with weather temperature extremes. Many can survive and thrive with very little soil. I've seen amazing specimens growing out of cracks in rocks. My wall is a mix of bright sun and shade and can be very windy. So I thought I'd have a go a trying a range of alpines in the holey brick wall and see what takes. So the plants that I chose for this experiment includes: Sisyrinchium biscutella and bermudiana, Saxifraga x urbium primuloides (dwarf London Pride, Dactylorhiza fuchsii (Common spotted orchid), Sempervivum topaz, Sedum Betram Anderson and Campanula poscharskyana. Obviously it would be better if I was planting these in spring, or even autumn, but given out no-so-hot summer, I figure it's worth a try. Let's see what happens.